I am completely gassed. Today I completed the last cuts I need to put the top stretchers into the legs of my saw horses. The last major hurdle was to cut the feet into something more interesting looking than a rectangle. Krenov, who designed these, has the feet with pleasing angles and a cut out on the bottom. I had delusions of grandeur and considered doing something different, but I couldn’t come up with anything I like better than the Master’s design. My desire to improve at using hand tools has driven me to cut all the joints by hand, so I thought I might as well make these cuts by had too. I learned several things today, not the least of which is that my conditioning needs some work. Though I usually try to be funny, sadly, the last sentence was just an observation; a sad, exhausted, middle aged and completely inconvenient truth. I don’t think my truth will garner me a Nobel though, but I digress, as usual. What else did I learn, you ask? Well I will tell you. Practicing with my chisels every day has given me the confidence to fix errant cuts. The second thing I learned is that my two fancy pants Japanese hand saws have an Achilles heel. The metal bracket at the top of the blade prevents certain cuts. When I was cutting out the portion at the bottom I started by drilling a hole at the point where the angle mark meets the parallel mark. This was done to give me a bit of extra space for my coping saw. Then I cut the angled cuts on each side. With the coping saw in place I began to cut. My approach to learning is to tackle the hardest tools, wood, and methods with vim and vigor. I choose to start with hard maple, because it is, well, hard. I don’t know if it is the hardest wood to cut and chisel, but it is certainly not the easiest. It seems reasonable that if I build my confidence on hard maple, then when I am working on another wood type, I should be fine. The cutting of an 8 inch line with a coping saw, through hard maple, turned out to be a herculean task. A few inches in, I decided to make another perpendicular cut and remove a portion of the piece I was cutting. This allowed me to use my smaller Japanese hand saw. Switching saws sped up the process considerably, but the aforementioned bit of metal running along the top of the blade, caused the cut to be slightly downhill. After another inch there was enough space to switch to the saw pictured. This is my first and least expensive saw, but it was the perfect tool for the task. Are the other 2 saws better? Yes, they cut cleaner, they have a finer kerf, and cut more quickly, but in this instance, they had to take a back seat. So I completed the cut and gave it a look. It was fair. Not so long ago, this would have made me sad. No more! I grabbed my marking devices, drew a line to true up the cut. 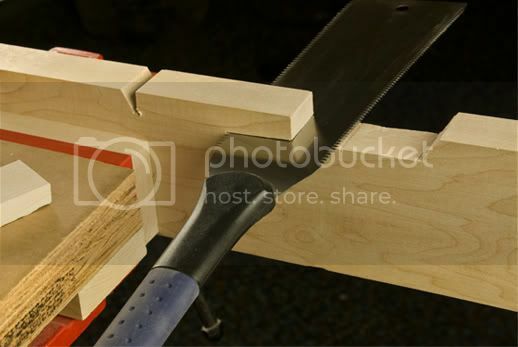 I clamped the piece of wood onto the workbench and began to chisel. After a couple of very noisy whacks, I remembered a comment from the blog, about workbenches being big and heavy. 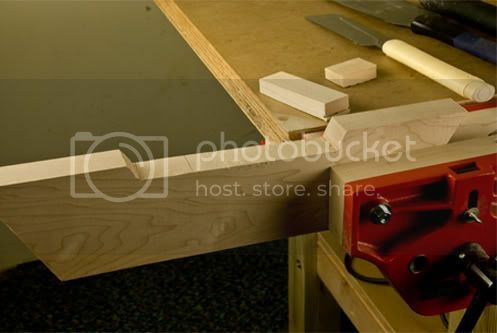 My first bench is not as massive as some that I have seen, but before I could fret about this, I decided to move my piece of maple and clamp it down over the leg. This worked wonderfully and was the third thing I learned today. So the foot got shaped the way I wanted it. That was the good news; the bad news is that there are 3 more of them. Though I want to practice daily, with my hand tools, I also want to improve with my circular saw and router. Yeah, yeah that it, I am not abandoning my philosophy, I am practicing something else. I am not taking the easy way out. In all truthfulness, I am sure the router will do a better job, with less exhaustion, but I have used it so little that I am sure it will be a bit scary. The first foot should be a good template for the others. Every tool is important and every discovery is a thrill. The finish line is within sight, the saw horses are nearly done, and I will be able to choose my next project. Will it be a router table or a book shelf? And most importantly, will my damn DVDs and books arrive tomorrow? I feel another rant boiling up deep inside of me. Type at you later. Congrats Brian. It looks like your “inconvenient truth” led you to some very “convenient knowledge.” Fixing your own errors is a big step in woodworking. You didn’t settle for fair and you made it right. Kudos to you. IMHO, expanding your tool arsenal is not cheating, even if it means using…gasp…power tools. With a router table setup and a pattern bit, you could create your first piece by hand then duplicate them on the router for consistency. Gives you the thrill and satisfaction of carefully sculpting the piece and still allows you to produce matching sets without the frustration. Congrats on your progress and thank you for sharing. I like what you are doing here with the handwork Brian and then machine work. It is fun and satisfying to do handwork, but not so great when the work gets repetitious. That double edged Japanese saw is very useful, but be careful with it and mindful that the top also is a very sharp saw. It is easy to forget this and cut yourself with it. How do I know this? Guess.